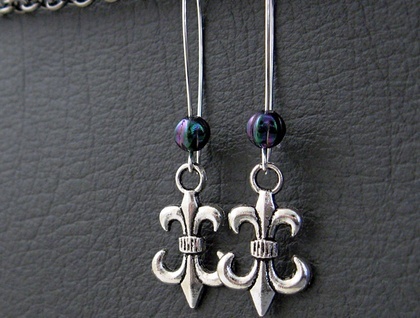 Antiqued-silver coloured, upside down fleur-de-lys charms hang elegantly from silver plated ear-wires. 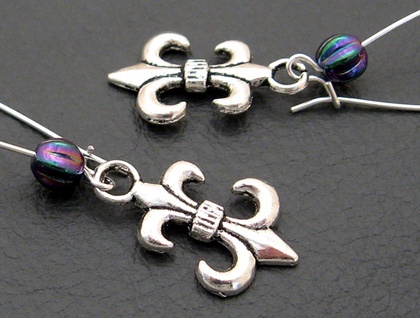 Above each charm, adorning the ear-wire, is a Czech glass bead in iridescent purple. Czech glass is famous worldwide for its high quality. These little purple beads are shaped like pumpkins, and have a sheeny finish that shows hues of deep blue, kingfisher green, and peacock blue. 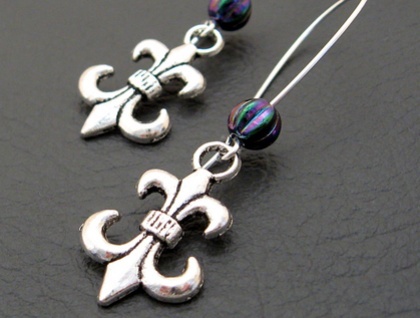 The fleur-de-lys charms are made of silver-coloured alloy, are hollow backed, and are more lightweight than they may seem in the photographs. Other 'jester' earrings, in other colours, are also available here in my Felt shop. 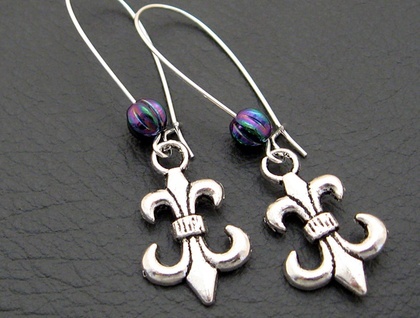 'The Purple Jester' earrings measure 55mm from top to bottom. The charms are 24mm long, including the baile (hanging loop), and 14mm wide. The silver plated ear-wires are copper based and are without nickel. However, if you would prefer stainless steel, silver plated ear-wires, just let me know in the 'notes for silverlight' field that will appear when you check out of Felt, and I'll change the ear wires at no charge. The stainless steel ear-wires will shorten the length of the earrings by 4-5mm. The glass beads have been simply slid onto the ear-wires, so it is recommended that you keep the ear-wires closed so that the beads do not slip off and get lost. Keeping the earrings hanging, rather than jumbled up in a jewellery box, will help to ensure that the ear-wires do not get opened or bent by other jewellery pieces pushing against them.